Previously a school, this nursery was extensively renovated and opened in April 2011. With 9 separate rooms and a team of dedicated childcare professionals, we care for children from 6 weeks right through to a vibrant after schools department. This light and airy building boasts 3 separate play area's for plenty out outdoor fun. 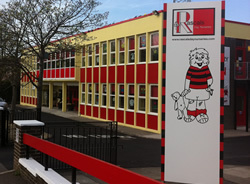 The largest branch of Rascals still manages to achieve a homely feel with care and learning activities for all. You should book an appointment today to view this branch of Rascals now as this busy nursery is very popular.